What is your philosophy on love/relationships? And here we come back to the endless topic of love. The other night I had a long conversation with a very close friend and we were discussing relationships of the past and what we are both wanting at this time and the future. It was really intriguing to learn how different our wants were. Neither want was better or more logical than the other (at least I don’t think so), they were just very different. She spoke of wanting to be married and I spoke of being very undecided. I told her how much I have changed in just the last couple of years. I respect people that want to get married and have dreams of family….I admire their convictions. For myself, my feelings have shifted and my philosophy on love (for myself) has changed quite drastically. I grew up assuming I would get married because that is just what you do when you get older. I would live the life with a house and a husband and children running around. I always thought that this was what I wanted but the older that I got the more I realized that I really was unsure. Yes, I would love to have a male companion in my life to share experiences with but I do not find it a necessity. This is strictly my opinion but I think a lot of people settle and I have settled more than once in the past and it only led to heartache at the time. I truly believe that some people are unable to survive on their own and I feel the need to prove that I can. I want everyone to remember (if they have read this far), this is simply my opinion based on my personal experiences. I am not saying that I am right…I am simply stating what I feel. My philosophy on love is that it should be one of the most simple, most natural things in the world. I believe that if two people are truly “meant” to be together that it should not be work….their lives will fall into sync. Even if the two do not always agree with each other, they are able to communication so easily because of being in sync. Real love does not come with doubt. I believe that when we keep questioning whether it is real or not then we are messing with the natural cycle of love. I know it sounds far-fetched to some but I spent many years of my life settling out of loneliness and the thought that I didn’t want to be alone because I was getting older. The societal clock was ticking and everyone around me was getting married and having children and here I was still alone. There is nothing wrong with being alone….absolutely nothing wrong. The problem is that people tend to confuse being alone with loneliness. My alone time is when I find my true loves…I fall in love with myself just a little bit more. I can’t help but think that if I have this amazing love for my life….how much more beautiful a love shared would be. I believe that love with another will happen at the exact moment it is meant to. For myself, everything inside of me tells me to live strictly for me. I completely respect everyone else’s choices….I simply speak for me. I may get married one day (who knows) but I do not feel it necessary for myself to prove that I love someone. Right now I find it vital to love myself before loving anyone else (romantically) and as time has passed the more I have found that love. I truly believe that the more you love yourself the more you are able to love another person….on a much deeper level. Yesterday I had someone respond to my blog and I won’t get into details but part of his comment was that he wanted to kick bleeding heart liberals out of the country or even just to hell. Those words haven’t left my mind because regardless of what my political standpoint is, I guess I do have a bleeding heart. Love is not something to take for granted and people may say I overanalyze it and take it too seriously but there are certain things I don’t think should be taken lightly. I have watched many people (friends, family members and strangers) go through tumultuous relationships and I have often wondered how those people perceive themselves. Sadly, I believe that far too many people do not have a healthy view of themselves and because of this relationships fail or suffer or should have never began in the first place. I know it seems like I am coming from a negative place but that is not my intention. People are going to take this their own way. I have experienced heartache before and I do not blame the other person for it. I have found that for a great deal of my life I have not been honest with myself…I have never really sat down and thought about what I really wanted and needed. I know that I cannot give myself to someone that would not be able to hear what I am saying and actually absorb it. I understand that my words may be nonsense to some but with true, don’t want to live without each other love, that will never be the case. Doubt will never arise. Love should NEVER make people feel bad….if anything it should make them feel better about who they are. Love should strengthen you and never weaken you. I know many people do believe that love takes work but I truly believe this to be untrue. Yes, relationships take work in means of learning the behaviors and habits of people but love should be simple. Love should not be a job. At this point I am just babbling. There is so much I question in life and I have absolutely no answers to anything. There are just certain things that I choose to believe for my own comfort. People can define love in any way they choose but it is through personal experience and convictions that we truly understand what it is. I guess my whole point in this rant is stating my belief that people should not settle. I wish some people would explore themselves more and really discover what they want when it comes to their individual lives and their shared lives. I believe this could open so many doors and not just in a romantic sense. I believe that the more we discover our individual selves and the more we are brutally honest with ourselves the more peace we find in our lives. We do not need to be in relationships to survive….we are all complete in this very moment….relationships should complement our lives. With those words I will depart in hopes that my words never offend people and simply allow them to see a different perspective. 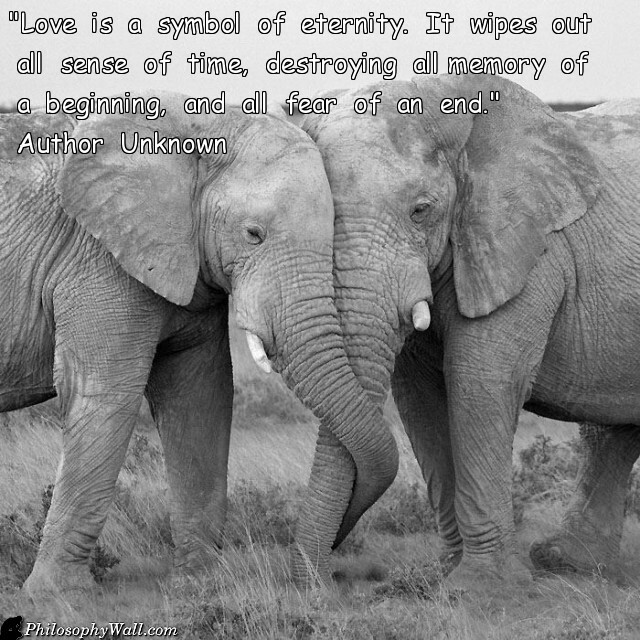 “Love is a symbol of eternity. It wipes out all sense of time, destroying all memory of a begining, and all fear of an end”. I couldn’t agree any less with this definition of love. Love in my opinion has certain characteristics that matches the description in the post I’m reblogging. Love is not dependent on gifts, neither is triggered by sharing. Love is independent of personalities, locations or seasons. Love is independent of time, space and size. Love is effective in independence and much more effective when it connects. There cannot be an effective connection without love but when love connects, it explodes. Love collaborates to produce exponential results. Love connects to multiply, not to add. Love operates in geometric progressions rather than arithmetic progressions. Love is not sustained by relevance but by resonance. Love is neither about what we offer or what we share but about who we are. None can love who does not posses love. Love resonates with love and produces more love. I can only love if I have love and I can only multiply love if I find love. Love lies within, love grows within. Love is excited when it encounters love and irrespective of differences, results of love explode. Love is too vast to be exhausted. I can start with love, continue with love until I loose track of both the origin and destination of love, and that is probably my position in this post on love. I have to stop, not because love has an end but because we have to develop the wisdom to express love within the confines of time and space available for us to love. I think you have some good thoughts. Especially about a relationship happening without struggle and problems it should be effortless action. When the relationship settles down and the bubbles have gone out of the champagne, It does entail work with both parties contributing sixty percent, that is love fifty percent is just a commercial deal, Thanks for following and thanks for sharing your young thoughts. I need to keep my old strings in tune, so will be surfing your blog some more. What is the story on the diving dog headder? Your “bleeding heart” is pretty damn awesome if you ask me. Keep on going. I see both sides and each is very positive. I did not have the time just to be me, married at 21 to a wonderful guy and two darling little girls came with the package. I was a full time mom at 21. My sweetie and I are still together and life is good for us. I was lucky in finding the right person the first time. My mom and her sister were both widowed at a young age. My aunt chose to stay single, got a good job, moved out of state, and had a great life and was loved no adored by her children and grandchildren. Mom remarried, but it seemed more because she was afraid of being alone than any other reason. They were both unhappy and she ended up his nurse maid as his health failed. Her unhappiness became a wedge between her and her family. I would rather be single in that situation and enjoy my friends, hobbies, passions and family than be trapped in unhappiness. If a person is single enjoy everything you can about being who you are and who you can be. If the right person comes along, consider carefully if you want to trade freedom for companionship. If you are in a committed relationship remember why you loved them because there will be times when you do not want to watch that show on TV, but you will watch because life is about compromise.